Mix all ingredients in a blender until thick and creamy. Note: If you do not have frozen fruit, you could use fresh fruit and add ice. Oh, the almond butter is a must — it makes the smoothie thick, and well, nutty! *Fresh-picked by Dad — thanks a bushel. This looks delicious – I especially like the glass of choice! Yum! That definitely looks super healthy and delicious. This makes me want a Vitamix even more! Looks great! (of course, I’m also a fan of the pint glass…) Happy Friday! Looks like I have all those ingredients in my fridge. I’ll be whipping this up after work! I tried putting kale in a smoothie once, and it didn’t blend very well, whereas spinach always blends perfectly. I could taste the kale too much! Womp. Maybe adding almond butter will help! 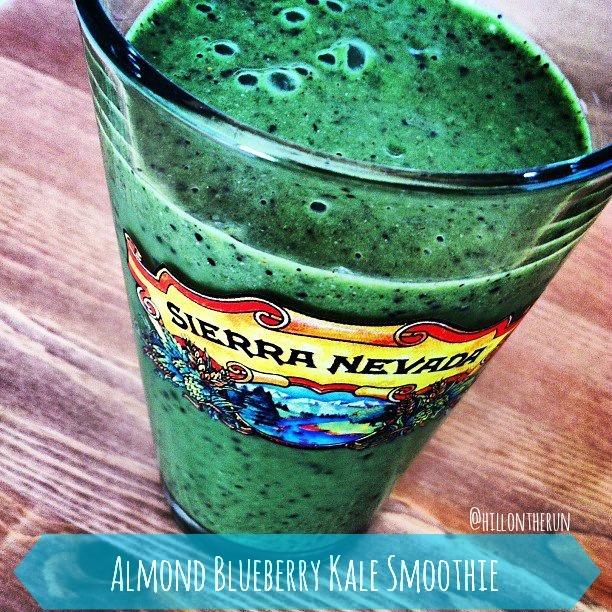 For this recipe, I used Earthbound Farm organic baby kale — I think the more tender leaves help make a creamier smoothie. Oh, good tip with the baby kale! I love kale, but I swear it never comes out good when I put it in a smoothie. I also really need to try putting blueberries in because this looks delicious! I love the irony of the Sierra Nevada glass. Reminds me how much I love drinking a beer in my running clothes post-long run.